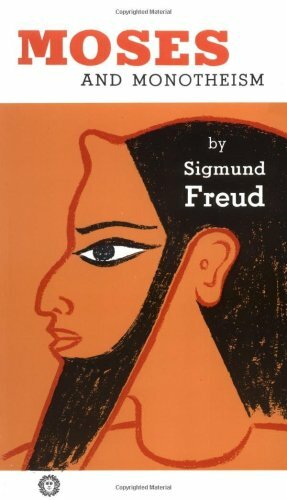 Moses and Monotheism has been the first full-length book that I read by Sigmund Freud. While I did read a number of articles and excepts by Freud, I didn’t have the chance to read a complete work until now. There is a lot to be said about the man and his works, and indeed a lot has been said and debated. Freud needs no introduction, or rather he often needs reintroduction. A very controversial and misunderstood person, if there ever was one. The father of psychoanalysis had much to say outside his prime interest and we’re lucky he published some of his more controversial materials. The reason I say this is very much evident in Moses and Monotheism. The book is an easy read, even though it’s translated from German. The topic, however, is very controversial. In fact, I suspect it’s mostly because of his religious convictions and ideas related to religious figures and history that really condemned him to the evermore hatred of the masses. Even though I was acquainted with his pen and style, I was still very much amused and pleasantly surprised quite a number of times. The book’s roots are in two articles Freud wrote for Imago, a scientific journal, back in the 1930’s. After escaping to England from invaded Poland, he was encouraged to publish the remaining text with the articles he had already written in a book binding. The idea is to try to analyse the psychology behind the different stories, laws and events written in the old testament. That is, the author is trying to reconstruct as much as possible what really could have happened to the Israelites in Egypt. There is a healthy doze of references to historians and other specialists which give more credit to his views. Two reasons to really find this book very well worth the read. First and foremost, the author isn’t coy of calling out the limitations and issues with the ideas he puts forth. He’s quick to criticize himself. On so many occasions did he mention how problematic or limited some of his claims are and suggested what could be tested and what is pure guesswork. It’s always refreshing to read such sober and mature author. Second, on a number of point he did make me pause to reflect on his explanations. I had to remind myself that this was the father of psychoanalysis after all, not a random author. Yet, I was still blown away by some of his points. Take for example a question that I spent countless hours contemplating without progress. Why do many (most?) people sympathize with figures, civilizations, lifestyle and virtually everything historic? That is, why is it almost universally accepted that there has been a great past that our ancestors enjoyed and everything is in constant decline and degeneration since? From people rejecting modern medicine in favor of “natural” and “traditional” medicine all the way to blaming modern cities and urbanization on all evils. There is something about the past that is universally appealing. Reading Moses and Monotheism yielded a very reasonable explanation: we associate the past with our childhood, which is typically remembered as peaceful and blissful. Sounds like Freud, doesn’t it? He didn’t need to make a strong case for this explanation. Perhaps he or someone else already did that elsewhere, but as it stands, he gives something everyone can experience more or less. While overall the book was a very good read, an almost complete century of progress in archaeology, history and psychology should have something to say about the then-untested hypotheses that the author puts forth, not to mention new evidence unknown at the time. And while none of these fields are even remotely close to mine, I could tell he’s probably already proven wrong on some of his educated guesses. Still, considering what he had to work from, he did a fascinating job overall. A thought provoking and insightful book. To read is to fly: it is to soar to a point of vantage which gives a view over wide terrains of history, human variety, ideas, shared experience and the fruits of many inquiries. There is hardly any activity that you can both perform on your own and alone, yet simultaneously share the experience with someone else. Paradoxical reading is. Books have been likened to many things, not least a good friend. And indeed a good book is at least as good a friend, but perhaps even more. Reading a well-written book takes you on journeys across the ages and worlds. But that’s not the real magic of books or reading. The magic is in seeing the world anew. Seeing the world from the eyes of a complete stranger… or may be an old and dear friend. For a good book is well worth returning to and reading over and over. I’ll say it here; one of the dreams that I wish to realize at old(er) age is, having read all the books I wished to read, to reread my favorites. There would be very little to compete with that personal joy of mine but to have all the books I loved to read the first time, to read over again. Like revisiting your childhood playground, like planing a reunion with schoolmates, I’ll look foreword to reopening those old pages again. But why reading? With all the technology we enjoy nowadays, why can’t other media completely replace reading? But of course they have, to a significant extent, replaced books and reading. But I can’t find any other form of media that can present thought as good as the written word can. That is, the best way to preserve and present thoughts is to use language. Whether spoken or written, language is the best tool we have to communicate our thoughts. And while the spoken word can give new depths to the words uttered, primarily by changing the tone, volume and enunciation, writing them gives the audience much more degrees of freedom in consuming the material. I do acknowledge that there is a whole category of concepts that we can hardly describe by words. We may choose to call these concepts the language singularities; where language as we know it breaks down. All forms of art can be said to have evolved, to lesser or more degrees, to fill this cleft in our language. But even then, art without context is too abstract to communicate unambiguously thoughts and ideas and complex concepts. It does a great job of communicating the aspects of our thoughts that we still can’t speak or write, in only (if you’d forgive the pun) so many words. Art is complimentary to language, but can never replace it. Language is more precise and more rich and, perhaps most importantly, can describe what can’t be. Using words, you can discuss paradoxes and other-worldly what-if scenarios. We can even talk about objects that we can’t create physically because they’re logically impossible or physics as we know it doesn’t allow for such objects to be. Like thinking about something being nowhere. Or a curved path being shorter than a straight one. Books serve more than one purpose. If it weren’t for books civilization as we know it wouldn’t exist. More accurately, I should say that if it weren’t for the written word, passing knowledge across generations would’ve been near impossible. Thanks to the scraps we inherited, we know not only what happened in the past, not only what some thought created, but we also know how some were forged, plagiarized and even distorted. We know how the powerful rewrote history. We even know why many, many texts didn’t survive. In some cases the lifetime of the then-paper technology was as short as a hundred or may be two-hundred years. But we also know that the important texts were copied and recopied by scribes. And indeed, the heretical, competing, unapproved texts were systematically sought and destroyed, and forever perished. This is precisely what we lose when we don’t read. By not reading, not only we don’t get to know what generations upon generations thought and did, but we also don’t get to know what there isn’t to know. That is, when we read, we know much more than what’s written; we also know what’s not written about. This may sound tautological, but it’s not. It’s easy to assume and guess, say, what the old Egyptians knew and could do. However, it’s a completely different thing to read what they wrote and discover there is not a single word of advanced technology beyond their age and time. It’s sobering to know what’s missing from the historical record. Granted, there have been systematic distortions by rivals left and right, and we can never know for a fact that what’s missing didn’t really exist. However we will know that it’s missing, probably because it didn’t exist. At the very least, when we do make claims, we’ll know how much it’s backed by evidential facts or in many cases, the lack thereof. And this is why books are important. Hardly can one know anything without sharing what others claim to know. Some hold a single book and revere it as the most important book. The first and the last. The only book worth of reading. They challenge others to find anything comparable to the beauty and wisdom of their book of choice. They challenge others to come up with anything even remotely similar to the words written in their book. Invariantly, I ask them, how do you know? How would you know where that single book stands without reading anything else? While many powerful social movements were at least in part fueled by fiction (Adventures of Huckleberry Finn on racial issues for example,) the fact remains that fiction needs to maintain an entertainment aspect. This quality of being entertaining, to my perception, compromises the integrity of the material. Put differently, to know what’s factual and what’s artistic, one has to work very hard, which will probably rob the book of its fun. I prefer to read fiction for the entertainment value and artistic and cultural characteristics, but I get my info and facts from nonfiction. Indeed, I find fiction disarraying when I’m attempting lucidity. I was looking for a good book that made a good case for the theistic beliefs without being preachy. That is, a book that introduced me to the arguments upon which the world religions build their theologies. The three world religions I speak of are the Abrahamic religions. Abraham, a prophet recognized by the world religions, is considered the first man to have had the honor of being spoken to directly by God. The oldest manuscripts to recognize Abraham’s status and record the encounter can be found in the Bible, or, as the Christians call it, the Old Testament. As such, the Jewish theology seemed to be the most reasonable source to contain the foundations I was looking forward to studying. This is one of the books suggested. 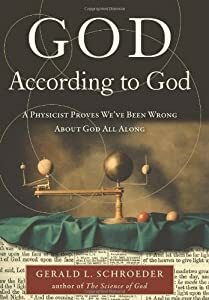 Gerald Schroeder‘s book is subtitled “A Physicist Proves We’ve Been Wrong About God All Along.” I get it, he has a degree in physics. What has that to do with anything? Is that not an attempt at appealing to authority? Should we trust his views, before even reading a single line, just because he has a degree in physics? Or does that show that he knows what he’s talking about any better? The estimated number of stars in the entire visible universe is in the order of 1022. This indicates that in the entire universe there may be approximately 104, or 10,000, earthlike planets circling a sunlike star. These 10,000 potentially earthlike planets would be distributed among the 1011, or 100,000,000,000, galaxies in the entire visible universe. That comes out to be one earthlike planet for each 10,000,000 galaxies. The probability that any one galaxy would have more than one life-bearing stellar system is slim indeed. To be honest, at this point I had already read 3 chapters and was a bit surprised that his conclusion wasn’t that Earth was by far the only possible host of life. Part of the reason for this expectation is his obvious bias to demonstrate how unique and rare life on Earth is. Although his assumptions are a bit conservative (for example he doesn’t consider the possibility of life on moons orbiting large planet, such as Titan,) his conclusion is spot on. For what it’s worth, I thought he wasted a good bunch of papers in this chapter, as the conclusion, if anything, convinced me that Earth is just a fluke, with a possible 10,000 more sprinkled around. What is so special about that escapes me. Our cosmic genesis began billions of years ago in our perspective of time, first as beams of energy, then as the heavier elements fashioned within stars and supernovae from the primordial hydrogen and helium, next as stardust remnants expelled in the bursts of supernovae, and finally reaching home as rocks and water and a few simple molecules that became alive on the once molten earth. In the Garden of Eden, 2,448 years prior to this revelation at Sinai, Adam and Eve were confronted with the identical options. This caused me so much cognitive dissonance that I went back to find the section where the cosmic origin, what he calls the “Big Bang Creation,” is described. This physicist apparently holds the belief that our planet has billions of years behind it, yet he maintains that Adam and Eve were in the Garden of Eden exactly 2,448 years before the revelation at Sinai! Considering the era when the Garden of Eden encounters supposedly occurred and the lack of numbers in any biblical or other sources, the above number is extremely precise. Not only that goes unexplained, Schroeder assumes the reader has already agreed to the Garden of Eden events as told in the Bible. In fact, that is my main point here: The author assumes the reader is a believer and well-acquainted to the theology and he’s basically giving scientific backing and, as is apparent in later chapters, throwing his own interpretation and understanding of the nature of God. Perhaps the title might have given a clue or two as to the conviction of the author regarding his understanding of God’s nature and plan. There is perhaps less color hues in a rainbow than different interpretations and explanations of God’s nature, plan and instructions to the human race. The author of God According to God adds yet another, and it’s not a conventional one, at least it isn’t to me. The sequence of events at and following the binding give compelling force to the supposition that the God of the Bible not only wants a dialogue with us humans, but even more than that. God expects such, and if the situation seems unjust or unjustified, then, beyond a dialogue, God wants us to argue. If our case is strong enough, God will even “give in,” or at least modify the Divine directive. Moses seems to have understood this trait of the Divine. Argument seems to be the standard and the expected biblical operating procedure in our encounters with the Divine. The surprise is that, having designed and created our universe with all its magnificence and granted us the freedom of choice, God wants us, expects us, to interact with the Divine about how to run the universe. As I read the events of the Bible, in human terms I see God in a sort of emotional bind. God desperately wants us to choose life, a dynamic, purposeful existence, but doesn’t want to force us along that line. Hence we are granted the liberating tzimtzum of creation. God has to hold back and let us try. When we really mess up, God steps in. It’s so human. Mom teaches junior to play chess. Looking over his shoulder as her son makes his moves on the board, she sees a trap developing. He is about to lose his queen. If she wants her kid to learn to think ahead, to envision the distant outcome of the initial move before that move is made, she will do well to keep her hands in her pockets and let him make the error or at most give a few very general suggestions, as God through the Bible gives to us. It’s frustrating, even painful, but it is part of the learning process, Divine as well as human. The above quotes are not the only cases that made me stop reading, and pause… for a while. It might have been that I had expected the run of the mill explanations and arguments. Instead, I found radically new concepts. Ideas I hadn’t encountered before. I can see that some of these ideas could be called heretical. If we make a strong case arguing with God, “God will even “give in,”” and “[…] God wants us, expects us, to interact with the Divine about how to run the universe.” And apparently, there is a “Divine as well as human” learning process! Whatever your stance on God and religion, God According to God isn’t a rehash of age-old arguments. Nor is it the typical “science proves the existence of God” kind of book. Gerald Schroeder is very well read on ancient Jewish texts. His Hebrew skills are of the translator caliber. His science is, as far as I can tell, solid. Overall, I learned quite a bit from the historical writings and the ancient Jewish theology that is blended in with the science and God’s strive to learn as we go. It’s just that I didn’t get what I paid for. Satire and sarcasm are two tools Stephen Colbert can’t stop using to give his otherwise very funny and sometimes hysterical skits some serious meat and subject. And I can’t seem to get enough of it. I Am America is a brilliant exercise in looking at the world upside down. The topics are contemporary and hotly debated in the public arena. Cobert’s take is narcissistic, self-centered, indifferent, proud and downright obnoxious. At least, that’s the character he pretends to be. A very ignorant yet opinionated pundit of the most annoying type. Indeed, if it weren’t for his humor and sarcasm, non of it would fly. 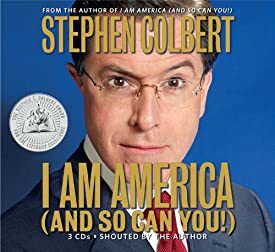 I’ve had quite a few laughs listening to the audio book version of I Am America. On a few occasions I even caught the attention of others seeing me seemingly bursting into laughter for no apparent reason, except for a pair of ear-buds, that is. Perhaps of the more memorable pieces are those on old people, family, religion and homosexuals. The part about pets didn’t resonate with me, but then again, I don’t have a pet. However, his wise words about his one issue with children, that he doesn’t like them, and his “rationale” were really sidesplitting. There was a cast who performed small skits at the end of each chapter which I was afraid would turn out to be dull, but on the contrary it wasn’t. They did a good job picking the right voices and actors. Apparently, Martin Luther King was worried that after he wins his cause, he’d find the pastorate leaving him wanting. To make up for it, he was available for hire to lead marches and protests. This was presented by a voice almost identical to King’s own, yet, the actor mentioned that he walked next to King (among others.) So while you shouldn’t think it’s King speaking, your brain can’t help but take the voice to be his. Amusing trickery. My only issue with this book is that the last one-third seemed more dry and somewhat serious than the rest. I found that a bit confusing, as the whole point of the character he’s playing is the satire and sarcasm. Once that waned, I found myself taking his words seriously and that’s dangerous when you know you’re listening to satire. I had to snap myself out of it a few times, to make sure I don’t take anything as fact when he’s clearly making stuff up as he goes. Like the “fact” that bathroom tiles are the cause of 80% of domestic fatalities. It may very well be true, but, it probably isn’t. I enjoyed this book quite a bit and found it very up-lifting. I’m just dumbfound for not recognizing Jon Stewart‘s voice in the audiobook. Rarely do short introductory books make any justice to complex and large topics such as history. 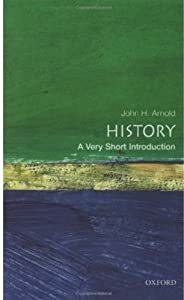 John Arnold made the exception in History: A Very Short Introduction. The book is a member of the highly renowned series of Very Short Introduction books by the Oxford University Press which has more than of its fair share of great introductory books. John explores the history of historiography and the emergence of the discipline. He uses quite interesting and amusing tidbits from the past to both entertain the reader and to examine a use-case that demonstrates how historians work. What I like most in this book is how the authors demonstrates that history and the past are not the same, nor are they equivalent. He stresses the point even further when he differentiates between history with a small h and History. The subjectivity and time-sensitive nature of history is well explained in this book. A point that many miss by a long shot. Some have even maintained that historic facts are equal to scientific facts, which couldn’t be further from the truth. Finally, John writes that history doesn’t tell us how it would have been had we lived in the past, nor does it teaches us lessons for the present and future. Rather, history tells us something about ourselves. By examining others in similar situations and searching about meaning in what happened in the past, we get insight in what we might do in our future. Recommendation: Highly recommended for everyone.